Mansfield Feed Mill cares about your animals. We carry a wide variety of pet supplies for your cat and dog. As a Purina Certified Expert Dealer our stores carry PMI Nutrition Exclusive and Red Flannel. We also carry Diamond, Taste of the Wild, Chicken Soup for the Pet Lover’s Soul, and other economical feeds. Looking for a holistic feed, check out PMI Nutrition Infinia. For pet lovers who only want the best for their companions, Infinia Holistic™ pet food provides a perfect balance of proteins, select carbohydrates, select fats and fruits & vegetables. Read more about it at Infinia Holistic. We also offer other holistic, grain free pet foods like PureVita, NutriSouce and Natural Planet Organics. Don’t forget your pet supplies! 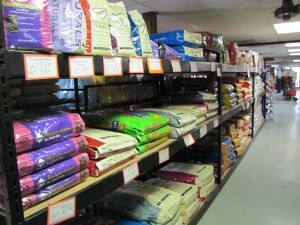 We have a large selection of supplies sure to please your pet. Flea & tick problems? We provide Frontline Advantage and K9 Advantix in single doses for cats and dogs.